When we hear “communication”, we usually think of speech between a few people. Well, that’s fine, however, recent mobile technology has redefined communication. In short, not only will you be talking with your apps, but you’ll also be talking to them! 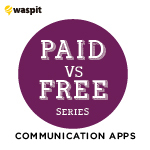 This week’s Paid vs. Free application analysis focuses on communication applications. Let’s take a look at how far your dollar goes towards premium communicative services. 1. Torque (Free/$4.95) - Android only - Torque is an interactive application, serving as the interpreter between you and your car. The aim of Torque is to provide you with displays, in real-time, of what your car wants to tell you (GPS status, gas milage, engine codes.) I definitely like the ease of a mechanical interpreter in my pocket, however, I found that this app is nothing like an actual mechanic, in neither the lite nor premium version. Still, Torque is novel and will probably lend you a ton of useful tips about your ride, for little to no cost. Breakdown: If you’re looking to become more knowledgeable about your vehicle, Torque lite is the perfect start. The advertisements can be annoying at times, but seeing that Torque is quick to update its display, it’s possible that the ads will not be so irritating in the future. I advise any casual drivers to download Torque today, and more serious drivers to invest in the full application. 2. IM+ (Free/$4.99) - iOS andAndroid - IM+ is an all-in-one collective for all of your chatting platforms. You’re offered, on both the paid and free versions, the ability to chat across platforms spanning from Google Talk to AIM to Facebook Messenger. I was surprised by the professional layout I found after booting up the application. Unfortunately, I found that just basic swiping around on the IM+ (free) was a little glitchy and slow. Then again, how much can you expect from a free, modular network of chatting platforms? Breakdown: Basically the free app is comparable and can contend with its paid counterpart. Mainly, the paid version is better than the free version aesthetically because of its lack of ads. Buying the paid app would be a generous tip of the hat to the developers, as the effort put into this app is notable, however, it’s far from perfect. However, if $4.99 is steep for you, the free application will definitely suffice. Although I tend to stress that budget, in life, is key, I can see myself splurging on IM+ (full) just for the cleaner interface and experience. 3. AIVC (Free/$2.36) – Android only - Finally, the future is here and it costs $2.36! AIVC is the mobile application version of a personal assistant. I was really excited to try out a few personal assistant apps to see how the technology has been coming along. I found some notable differences between AIVC free and full (pro in this instance). AIVC is interesting to say the least. The free version provides you with a plain layout — one button does all. Speak to your phone and command AIVC to do anything from getting the weather to texting your friends. The catch? The free version is undeniably flawed, and for some reason it likes to read you the weather in English but present it on screen in German. Breakdown: AIVC free is a fun toy to mess around with but I’m not sure that it will definitely boost your productivity. On the other hand, AIVC pro is known to be more accurate and can respond well to a wider span of commands. I feel there is room for growth for the paid version, but there definitely needs to be some immediate improvement in AIVC free for me to recommend it to anyone as a serious communications tool. Can you see yourself investing, on average, $5.99 for an app you hope to talk to or with everyday? The communications technology is promising, and I hope a lot of you answer yes because of it! Leave a comment down below and let us know what you think! And as always, thanks for reading.